Water in oil emulsions create problems in all oil field. These emulsions are generally destabilized by thermal, chemical and electrical methods or by employing some ionic or non-ionic surfactants in combination with thermal or electrical methods. It is known that clays affect the stability of these emulsions. Some researchers have reported the effect of ionic liquids in improving the demulsification of emulsions partly stabilized by clays. Therefore, an attempt was made to examine the synergistic effect of alum and demulsifier and it was found that at high concentration of demulsifier plus alum, the demulsification rate is abnormally increased. For effective demulsification, demulsifier dose of 10000 mg/l was found to be the best dose. Water-in-oil types of emulsions are frequently encountered in oil fields. In these types of emulsions, water droplets are dispersed in oil. The breaking of a crude oil emulsion into oil and water phases is very important in oil industry. The best process of demulsification involves a high rate of separation, minimum residual water in the crude oil, and a small amount of oil in the disposal water [1-3]. For better oil production it is required that dehydration and desalting of crude oil be done efficiently and at the same time effluent water treatment should be done while considering the environmental concern so that ideal conditions for demulsification can be achieved with the formulation of an appropriate demulsifier [4,5]. Asphaltenes and resins are considered to be the natural stabilizers in crude oil emulsions [6,7]. So for efficient dehydration process it is very important to know the properties and characteristics of these natural constituents of petroleum which have very strong interfacial activity [8,9]. In the demulsification process, the stability of interfacial film in an emulsion is affected by replacing the emulsifier (stabilizer) in the interfacial film by some other strong surface active agent called demulsifier. The resulting new film must possess less compact structure and should be able to allow better coalescence of the droplets [10-12]. Interfacial tension and viscosity are the two factors which basically account for the spreading behavior of a liquid. So, how fast oil will spread on water or to what extent spreading will take place depends on the force of attraction or repulsion between the different molecules of oil and water on the surface. In general, more is the extent of spreading, lesser is the interfacial tension with water . It has been found from the experimental investigations that the pH of aqueous phase highly affects the interfacial activity of natural asphaltenes and resins . For every emulsion, there exists a definite pH range at which minimum adsorption of film material (e.g. asphaltenes) takes place and emulsion shows minimum stability. In these conditions, very low dose of surfactants is required to resolve the emulsion [15,16]. The effect of temperature on emulsion stability was explained by Reisberg and Doscher , where they found that higher temperature helps in the formation of rigid interfacial films. Weak carboxylic and phenolic acids are also found in crude oils and if the aqueous phase is alkaline, the weak acids convert into their soaps and then stabilize the film . But, in emulsions containing high concentration of asphaltenes, the emulsion stability is decreased as film forming asphaltenes are displaced by these soaps. Biwetted solids can stabilize the emulsion by forming a physical barrier at the oil-water interface and avoid the coalescence of water droplets . In order to destabilize this mode of emulsion stability (biwetted solids) a surfactant that promotes the complete wetting of solid contaminants by either phase (oil or water) is more effective. The biwetted solids that are oriented at the interface will be driven either into the oil or water phases depending on the chemical structure of the surfactant (wetting agent). Solids, like colloidal clays, whenever near flocculating stage forms skins and stabilize emulsions. The clay solids mostly stay in water phase and do not behave like biwetted solids. Keeping alkaline pH can minimize the harmful effects of clays in emulsion stability. Bhattacharaya  have reported the effect of alum in improving the demulsification of emulsions partly stabilized by clays. In this paper we have studied the synergistic effect of alum and demulsifier on demulsification of crude oil emulsions by altering the physical properties of interfacial active materials by treatment with alum in conjunction with surfactants and heat. Water in crude oil emulsions from Mukta oil field Gujrat, India was used as emulsion samples in the study. Acenol TDEX demulsifier from Hico Products Ltd., Mumbai and Alum from a local manufacturer were used as received. 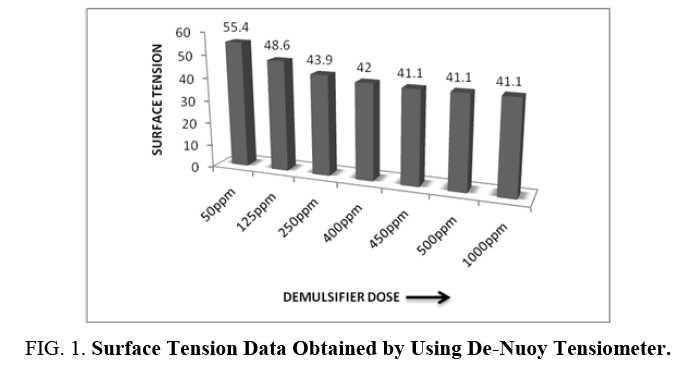 The CMC of the demulsifier Acenol TDEX was determined by adding varying amount of demulsifier in the native emulsified water (obtained by ultrasonic breaking of emulsion) and determining its surface tension using De Nuoy Tensiometer. Experiments were conducted to know the interfacial tension at different pH and varying demulsifier dose. The interfacial tension was determined using Spinning Drop Tensiometer. The results of synergistic effect of alum and Acenol TDEX demulsifier are shown in TABLE 1. From the results, it is noted that at high concentration of demulsifier plus alum, the demulsification rate is abnormally increased. Besides increase in demulsification rate, another problem of sludge (hydrated alum) disposal may arise. TABLE. 1. Synergistic effect of alum and acenol tdex demulsifier. The surface tension data using De Nuoy Tensiometer is presented in FIG. 1. From the experimental data, it was observed that 450 ppm is the CMC of the demulsifier and any further addition of the surfactant leads to the formation of micelles. FIG. 1. Surface Tension Data Obtained by Using De-Nuoy Tensiometer. The demulsifying action of demulsifier is a function of its ability to lower the interfacial tension. The demulsification rate was maximum at pH 9.5 plus 5000 mg/l demulsifier dose. 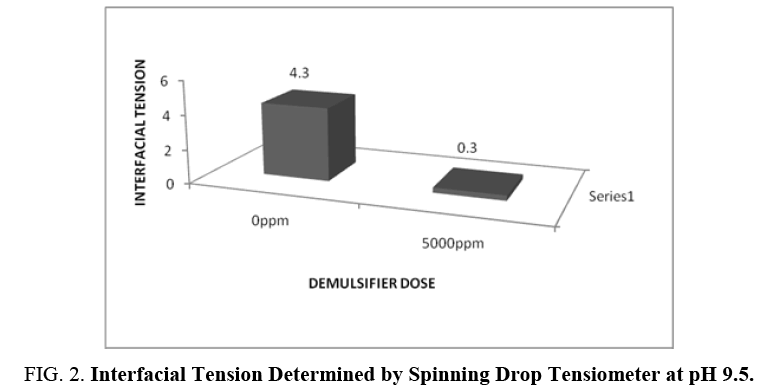 The interfacial tension data determined by using Spinning Drop Tensiometer is presented in FIG. 2. FIG. 2. Interfacial Tension Determined by Spinning Drop Tensiometer at pH 9.5. Acenol TDEX, in combination with alum, was successful in resolving the emulsion at dose of 10000 mg/l, which seems to be on higher side leading to the fact that the energy barrier to coalescence must be extremely high, since the emulsion had shown no tendency to separate into oil water layer. During the interfacial area covering, which requires large demulsifier concentration, particle size distribution is favorable towards lower side. The low critical micelle concentration (CMC) value and high interfacial activity of Acenol TDEX give it the characteristics of superior surface activity than the naturally occurring surfactants at the interface. As the demulsification rate increases it appears that demulsifier itself does not form a durable film at the interface and probably the demulsifier film is liquid, which is able to displace the existing interfacial film. The demulsifier is basically anionic in nature and is blended with alum. The blending with alum is reported to increase the spreading coefficient of anionic surfactant at the interface. This perhaps is yet another reason for high interfacial activity in excess of CMC value, as reported in the present studies which involved higher concentration. At this higher concentration, the demulsifier will form micelles in water phase with high aggregation number. Large polar molecules such as asphaltenes and resins are believed to be solubilized in water phase, between the individual molecules of surfactants in the palisade layer with the polar groups of the solubilize oriented towards the polar groups of the surfactant and non-polar portions oriented towards the interior of the micelle. This solubilization of the asphaltenes material into the water phase across the interface weakens the interfacial film (film ratio lowers). This was confirmed by finding the high concentration of asphaltic material in the separated water layer. Higher temperature, 80°C in the present study, results in an increase in the extent of solubilization of polar fractions, because increased thermal agitation increases the space available for solubilization in micelle. The acceleration in demulsification rate at pH=9.5 confirms the view that Mukta emulsion is primarily stabilized by asphaltic films because these materials are strongly affected by pH. The drop in demulsifier dose, from 10000 mg/l to 5000 mg/l confirms that interfacial film is thinned at pH 9.5 and probably the film ratio has decreased to maximum. The temperature alone magnifies the effect of pH on thinning because at higher temperature the dissolution of the film forming materials increases into the continuous phase. Buffering ions might be expected to maintain the uniform pH at the interface and the bulk. The amount of inhibiting cations from clay i.e., Ca++ and Mg++ was found to be very low. It can, therefore, be argued that the alkaline pH would easily disperse the clay into the water phase and minimize the stability of emulsions due to clay. The tolerance of the mixing time at pH=9.5 might be expected to equilibrium particle size distribution after they are destabilized by the addition of demulsifier. The experimental studies undertaken in the laboratory using weathered-tough Mukta crude emulsion have indicated that the demulsifier in combination with alum is of superior surface activity compared to natural surfactants present at the interface and is thus able to displace it from the interface. The stability of Mukta crude emulsion is significantly reduced by altering the physical properties of interfacial active materials by treatment with alum in conjunction with surfactants and heat. Although, it is not a common practice at present, however, if adopted, cost of dehydration of Mukta crude emulsion can be substantially reduced. In addition to pH, various other factors such as viscosity, water-oil ratio, brine composition, fine solids, mixing intensity, mixing time, temperature and aging also affects its stability. Therefore, the results of various variables determined by laboratory experiments can help evolve useful parameters for most effective field demulsification of Mukta crude emulsion. The oil tank sludge, consisting of high density components and emulsified water commonly deposited at the bottom of oil storage tanks can also be effectively resolved by adjustment to its optimum pH. This process can further help in periodic cleaning of aforesaid oil tanks. Kokal SL. Saudi Aramco (SPE document) Crude Oil Emulsions. Petroleum Engineering Handbook. 2006. Akay G, Pekdemir T, Vickers J. Improved methods for separating oil and water. Patent Cooperation Treaty, Int Publication Number, WO 02/10070 2002. Abdurahman HN, Nuraini M. Chemical destabilization on water in crude oil emulsions. World Academy of Science, Engineering and Technology. 2010;62:700-3. Puskas S, Balazs J, Farkas A, et al. The significance of colloidal hydrocarbons in crude oil production part 1. New aspects of the stability and rheological properties of water-in-oil emulsions. Colloids Surf A: Physico Chem Eng Aspects. 1996;113:279. Stalss FR, Kupfer R. Improved demulsifier chemistry: A novel approach in the dehydration of crude oil. Society of Petroleum Engineers-Production Engineering. 1991;pp:334-8. Mohammed RA, Bailey AI, Luckham PF, et al. Dewatering of crude oil emulsions 2. Interfacial properties of the asphaltic constituents of crude oil. Colloids Surf A: Physicochem Eng Aspects. 1993;80:237. Alcázar-Vara LA, Luis S, Zamudio-Rivera, et al. Effect of asphaltenes and resins on asphaltene aggregation inhibition, rheological behaviour and waterflood oil-recovery. J Disp Sci and Technol. 2015;37(11):1544-54. Acevedo S, Escobar G, Gutierrez L. Isolation and characterization of natural surfactants from extra heavy crude oils, asphaltenes, and maltenes. Interpretation of their interfacial tension-pH behaviour in terms of ion pair formation. Fuel. 1992;71:619-23. Mostafa L, Shahab A. Effects of asphaltene, resin and crude oil type on the interfacial tension of crude oil/brine solution. Fuel. 2018;223:261-7. Blair CM. Interfacial films affecting the stability of petroleum emulsions. Chem and Ind (London). 19660;pp:538. Mukherjee S, Kushnick AP. Effect of demulsifiers on interfacial properties governing crude oil demulaification. In: Oil-Field Chemistry. Enhanced Recovery and Production Simulation. Borchardt JK, Yen TF, editors. Am Chem Soc. Washington, DC. 1989;pp:364-74. Williams TJ, Bailey AG. Changes in the size distribution of a water-in-oil emulsion due to electric field induced coalescence. IEEE Trans Ind Appl. 1989;pp:536. Yamamoto D. The evolution of spatial ordering of oil drops fast spreading on a water surface. Nat Commun. 2015;6:7189. Hutin A, Argillier J, Langevin D. Influence of pH on oil-water interfacial tension and mass transfer for asphaltenes model oils. Comparison with crude oil behavior. Oil Gas Sci Technol. 2016;71:58. Breen PJ, Yen A, Tapp J. Demulsification of asphaltene-stabilized emulsions-correlations of demulsifier performance with crude oil composition. Petroleum Science and Technol. 2003;21:437-47. Shahab A. The effects of pH, acidity, asphaltene and resin fraction on crude oil/water interfacial tension. J Petroleum Sci Eng. 2018;162:341-7. Zaki Y. Demulsification and extraction of biochemicals from crude and its fractions using water and subcritical/supercritical carbon dioxide as proton pump with pH tuning without precipitating oil components. United States Patent, US 9,562,198 B2. 2017. Zhang D, Thundat T, Narain R. Flocculation and dewatering of mature fine tailings using temperature-responsive cationic polymers. Langmuir. 2017;33(23):5900-9. Kim YH, Nikolov AD, Wasan DT, et al. Demulsification of water-in-crude oil emulsions: Effects of film tension, elasticity, diffusivity, and interfacial activity of demulsifier individual components and their blends. J Dispersion Sci and Technol. 1996;17:33-53. Bhattacharya SN, Ramana PV, Singh K. Alum-non-ionic surfactant combination: An effective demulsifier. Soc of Petrol Eng. 1975.